If you thought New York City’s parks are all at ground level you’d be wrong. Highline Park is literally up in the air. Built on a former elevated freight railroad called the West Side Line, the 1.45-mile long High Line Park is on the West Side of Manhattan. The High Line Park includes two sections and covers 6.73 acres. Section 1 of the park runs from Gansevoort St to W. 20th St and opened to the public on June 9, 2009. Section 2 running between W. 20th -30th St opened June 8, 2011. According to the High Line Park’s web site, the freight rail line operated from 1934 to 1980 and carried meat to the meatpacking district and agricultural goods to factories and warehouses of the industrial West Side. Not to forget the mail to the Post Office. 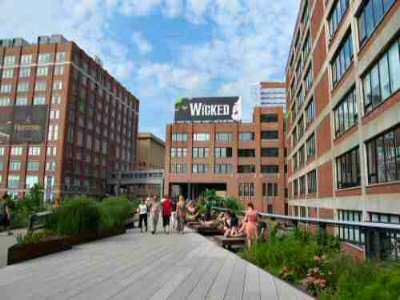 High Line Park is accessible from Gansevoort St, 14th, 16th, 18th, 20th, 23rd, 26th, 28th and 30th Street. High Line Park is wheelchair accessible. Elevator access is currently available from 14th, 16th and 30th Streets. Dogs not allowed inside the High Line Park. Restrooms at 16th St access point.